Kepi, US or CS, leather brim and sweatband. Cotton lining like the originals. Please Note, the rules for ordering Hats from the Quartermaster Shop are the same as their uniforms. All special order hats require a minimum of 6 - 8 weeks for production. Some US styles and ALL CS styles (except medium grey) fall into this category. These are made to Order to each customers specifications. Once the material is cut, there are no refunds, and no returns unless a mistake was made in production. If you want a cheap foreign made Kepi or Bummer, please do not order one of these. Please use the "Hat Size Chart" at the bottom of this page to determine your hat size. The CS Version is available below with branch trim colors. Confederate Kepi, Enlisted. Correct style for Confederate Artillery, Cavalry and Infantry. Branch color top and crown with a dark blue band around the base. Leather brim and sweatband. Cotton lining like the originals. Hand made by The Quartermaster Shop. These are the finest production Kepis available. W/chinstrap. Choose from CS Artillery (Red), CS Cavalry (Yellow), CS Infantry (Sky Blue) another option is Medium Grey with a Dark Blue Band. Enlisted Confederate Kepi :. This is the Alternate version of the Confederate Kepi with Branch trim. This style saw little or no use during the conflict, but it has become popular in modern times for reenactors. (Now that I said that....) This hat features a grey body with a band color indicating the branch of service. Also sporting a Leather brim and sweatband with a cotton lining like the originals. These hats are hand made to order and not returnable, so please be sure of size and type prior to ordering. Enlisted Confederate Kepi :. As above, only this is our "Fall Creek" brand. These are still hand made, in the US at a slightly lower cost. This hat features a grey body with a band color indicating the branch of service. Also sporting a Leather brim and sweatband with a cotton lining like the originals. American Made. Confederate Artillery Bummer, Correct style and colors with a red wool top and crown, and dark blue wool band. These hats feature a cotton lining and leather sweatband. Leather brim as well. Hand made. Confederate Officers Kepi- Lieutenant and Captain. Made by the Quartermaster Shop. Each hat is hand made with strict attention paid to the details. These are the finest production made CS Officer hats available. As with the CS Uniforms, there are many variations and options available. Please be specific when ordering, as custom made hats are not returnable. Most of these hats are individually made to order to your specifications. There are two variations for these two junior grade officer hats- Model of 1861 and Model of 1862. The Lieutenant's standard braid pattern has one row of gold Soutache braid on the top, sides, front and back of the cap to indicate a Lieutenants rank. A single row of braid encircles the quatrefoil design on the top. The Captain's rank with standard braid pattern has two rows of gold Soutache on the top, sides, front and back of the cap. A single row of braid encircles the quatrefoil design on the top. Two rows of braid placed horizontally around the band of the cap are offered as an extra cost option (Captain Only). Also, an Extra Rich Deluxe Gold FLAT braid is available in place of the standard Soutache braid Either Lieutenant or Captain. The 1861 version is a grey cap with a colored band (Branch of Service) around the bottom of the cap. The 1862 version has the top and sides of the cap in the branch of service colors and the lower band is dark blue. Other color combinations can be custom made based on documentation- please call. Branch colors are appropriate for the three main branches. CS Medical and Staff have a black band with Dark Blue. Militias can have a black band with top color choice. Also available with no color band- top and sides all one color. A thin leather binding can be added to the edge of the brim for a more finished look- see options below. Confederate Officers Kepi, Field Grade Officers - Major, Lt. Colonel, Colonel. The Officer's cap to the left follows the 1862 Regulation color for Staff Officers (Staff Only)- All Dark Blue. The Cavalry Officer's Kepi to the right follows the 1861 Regulations with colored band and choice of wool color for the sides and top. Major, Lt. Colonel and Colonel all carry three gold rows on the top and sides. The 1862 Regulations are the same as for the junior grade officers- dark blue band with Branch color on the sides and top (Red, Yellow, Blue, Cadet Grey, etc. An all over color with no dark blue band is also available. The standard braid pattern cap has three rows of gold Soutache braid on the top, sides, front and back of the cap to indicate Field Grade rank. A single row of gold braid encircles the quatrefoil design on the top. Extra Rich Deluxe Gold FLAT braid and three rows of gold braid placed horizontally around the band of the cap are offered as extra cost options. All officers caps are custom made - allow 8-12 week delivery. The standard braid pattern for Generals has four rows of gold Soutache braid on the top, sides, front and back of the cap to indicate rank. A single row of braid encircles the quatrefoil design on the top. An Extra Rich Deluxe Gold FLAT braid and 4 rows of gold braid horizontally around the band of the cap are offered as extra cost options. Following the 1862 CS Army Regulations, Generals caps are ALL DARK BLUE. Black cotton lined with Confederate Eagle side buttons. Other wool color combinations can be made based on documentation, please call. A thin leather binding can be added to the edge of the brim for a more finished look- see options. Regulation Hardee Hat, Deluxe heavy fur felt. Leather sweatband. Features a Stitched Edge for Enlisted, examples to the right. 6" high crown. Enlisted Insignia consists of Correct Brass insignia for the front of the hat, Brass Hardee Side Eagle, Appropriate Wool Hat Cord, and a Black Ostrich Plume. Insignia is not installed due to variations in positioning by different units. Officers Hardee Hat. Deluxe quality, as above. Heavy wool felt with ribbon bound edge. Turned up on right side. Available either plain (Left), or including all appropriate embroidered officers insignia. Optional Insignia includes- Gold/Black Hat Cord, Branch Insignia on front, Hardee Hat Eagle, Black plume (As Shown) . Slouch Hat, Beehive Style. Made at the Dirty Billy factory by Dirty Billy himself. These are hand formed and blocked in a period style. Ribbon edge brim with a ribbon around the crown. 100% Wool felt. The exterior is authentic, the interior is machine finished. This style is correct for all usage's, and was used as background hats in several movies including Gettysburg and Gods and Generals. Available in Camel (Medium Tan), Black, Chocolate Brown. Available in sizes Medium (7 - 7 1/8) , Large (7 1/4 - 7 3/8) and Extra Large (7 1/2 - 7 5/8). Note!- Dirty Billy Hats are usually made to order for us. We therefore may not have the specific hat that you desire on the shelf and ready to ship. Please call for availability. 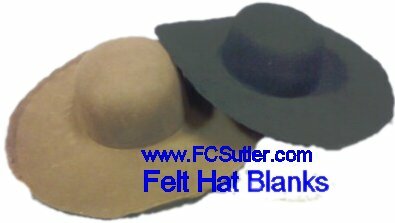 Felt Slouch Hat, Plain floppy hat to wear as-is, or can be reshaped. Available in Black, Brown, Tan. Not sized. No Sweatband and a raw unfinished edge. This hat is the blank from which "finished" hats begin. For use by those that want to start from scratch and shape/design their own hat. Also works well for the "floppy" hat look as worn by country folks, civilians, etc. Not all colors are available at all times. If you wish to specify a color, please do so in the "notes" section of the ordering process. be sure to indicate first and second choices. 100% Virgin Wool Felt. Comfortable, water repellent, and treated for shape retention. Crushable, and these hats will come back to their original shape. Our most popular in this line. Comes with a sewn in sweat band, and cord around the outside. 3 1/2" Brim with a sewn and bound edge. Genuine Lite Felt. This hat in Pecan ( light brown ) is a Fall Creek Exclusive. "Small" size is also available from time to time, please contact us. We can also add military hat cords and insignia to this slouch hat as desired. Very nice "Planter" style hat featuring a low crown and 3 1/8" bound brim. Sewn in sweat band. Genuine Lite Felt. This hat in pecan ( light brown) is a Fall Creek Exclusive, we may or may not have the size you need in stock, if not in stock it may take a while to obtain. 2 1/8" brim with sewn ribbon edge. Approx. 6" tall rounded top. The deluxe style in this line, not the cheaper felt hat offered elsewhere. The Famous "Topper" is now available. 2 1/2" brim with stitched ribbon edge. 7" tall. Sewn in sweat band. Deluxe 100% wool felt. 2" wide grosgrain ribbon hat band with a bow on the side. Straw Hat, Hand Woven straw. Flat crown with a 3 1/2" brim. For Men, but a few women wear this style as well. Leather sweat pad inside. Hat Cord, Worsted wool cord with wool tassels, Made exactly like the originals. Fully adjustable.